To kick off the holiday beauty season (yay! ), here is the first of many a review to come! As soon as I saw this baby, I knew I had to have it. 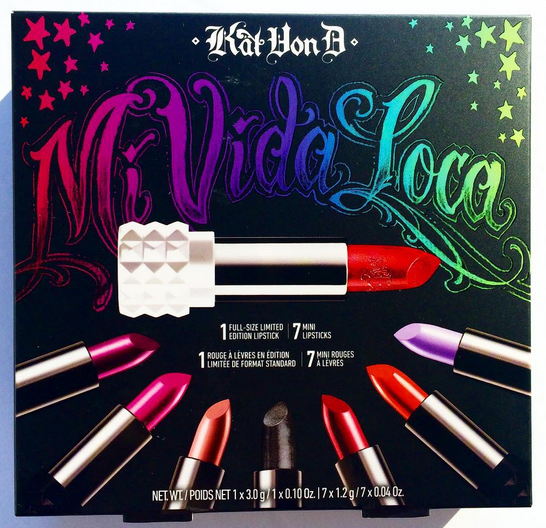 Kat Von D is sold exclusively at Sephora, and her bold colors offer a great selection for the edgy and daring beauty experimenters, but also quality products in solid choices that even the more-reserved of us can play with. This eye-catching kit comes in her rainbow coloring, which you’ll also find on her new, color wheel, eyeshadow palette: ‘Mi Vida Loca Remix’ Eyeshadow Palette. This gorgeous kit comes with seven, mini, Studded Kiss lipsticks in colors we all know and love: Noble, Halo, Bachelorette, Wolvesmouth, Sexer, Coven, and NaYeon. Of these guys, I found that Noble, Bachelorette, and Wolvesmouth were all totally wearable. The rest were more on the daring side. I have to admit, Halo is one of the most GORGEOUS colors I’ve ever seen. 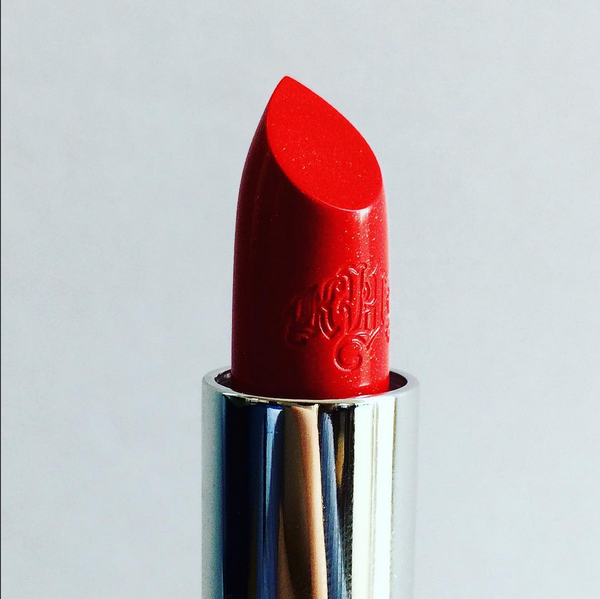 I’ve never seen a lipstick like it. It looks like like a bland orange color in the tube, but when you put it on, that’s when it reveals it’s light-reflecting iridescence. Stunning. This kit also comes with a FULL SIZE lipstick in an EXCLUSIVE color: Goldblood. Cue the ooo’s and ahhh’s. Goldblood is a bright, warm red with subtle gold flecks. I mean, look at this baby. It’s totally wearable, and I even wore it to work. If you layer it, the gold gets a little more intense but nothing too over-the-top. Like all other Kat Von D Studded Kiss lipsticks, these babies pack intense pigment and do feel slightly drying. They all dry with a mostly matte finish and have pretty solid staying power. I’ve found that the formulas with shimmer in them stay on far longer than the ones without. It’s like how glitter nail polish stays on way longer. Note to self, add sparkles to everything. This kit costs $41, while a single, full-size Studded Kiss lipstick costs $21. You’re definitely getting more than two, full-sized lipsticks’ worth of product, but you get more colors than just two. I love these types of kits, because I love to change up my lipstick. I also get to experiment with different colors, without feeling guilty about dropping big bucks on a giant tube that I might rarely wear. Having worked at Sephora, I know for a fact that these holiday kits sell out and they sell out fast, way before most people start their holiday shopping. If you want one for you or someone else… or for you (be real, people), then don’t hem and haw too long. This one is one of the cheaper holiday kits, but it also comes with a few colors that are more edgy. If you don’t think you’ll ever wear them, this kit might not be for you. Don’t despair, I’ll be writing about another kit very soon that is excellent for everyday wear. Stay tuned!